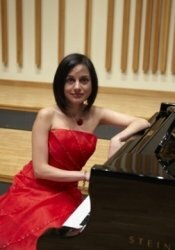 I am an internationally recognised, experienced and qualified piano and music teacher and performer. I hold a doctorate in music from the Sorbonne in Paris and a Magister from the Tchaikovsky Academy of Music. more than 15 years, teaching in Canada, France and the UK at all levels. Above all I want my pupils to love music, feel it and feel the poetry of their souls… I am also extremely funny and love good laughs!! Assay MichelleFrom Emma (5/5): Michelle is clearly highly qualified in both practical and theoretical music. We have been greatly impressed with her caring, friendly approach, flexibility, enthusiasm and a genuine passion to help our daughter in every way. Reply from: Assay Michelle: Emma said a sentence that made me cry with joy: "music is my life"… Thank you!